Gods and Goddesses in the Indus Valley Civilization: India is truly a Nation of gods and goddesses. Never was there any other such Nation which had such a deep influence of religion on the common people of that period. As of today, there are nearly 30 million gods and goddesses in India. Each of these is worshipped for specific reasons. One rarely finds any building or structure or place of worship, in the remains of Indus Valley Civilisation. There are only a few remains of Pasupathi – proto-Shiva – the protector of the cows and bulls, and also other domestic animals of the People. For, Agrarian Economy was the backbone of the settled life of Indus Valley People. And bulls, cows and other domestic animals were essential to the basically agrarian but an advanced and developed Economy of those early days. The Indus Valley People, being native Dravidians, buried their deascrid with great care, and with meticulous attention. The dead were interned in special burial pots, with their personal belongings. This was done before they were buried in the ground. Thus, the human beings born brought up and living on the earth, finally returned back to earth. The People of the Indus Valley Civilisation found their final and permanent resting-place in the earth. It was the earth that nourished and sustained them, before they themselves turned into dust, to integrally merge with the dust of the earth. Thus, they returned all the elements in their body that had come from the earth, back to earth. 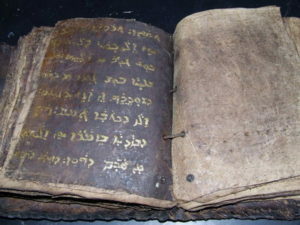 Objects found tend to indicate some form of religious beliefs. There has been evidence that the people of the Indus Valley Civilization believed in some form of animal and nature worship. The figures of deities on the seals indicated that they worshipped gods and goddesses in the human form. No major sculpture survives except for a bust thought to be of a major priest and the stunning bronze dancing girl. 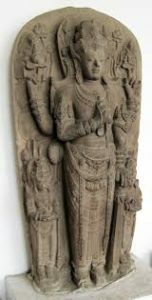 The Divine Mother appears to have been an important goddess, due to the countless terra-cotta statues of her that were found. It follows a school of thought that would become prevalent later as well, of the female energy being regarded as the source of all creation. Which God was Worshiped by Indus Valley People? What is most interesting is the existence of a male god which has been identified as a prototype of an important God of the religion of Hinduism, Lord Shiv. The fact is that the same God is still worshipped today. As a matter of fact, for the last five thousand years is one of the remarkable features of Indian culture. Even evidence of the Bhakti cult (loving devotion to a personal God) has been found at Indus Valley Civilization sites. This Bhakti cult also has a large following even today. It can, therefore, be concluded that there is a close relationship between the beliefs of the Indus Valley Civilization and that of modern Hinduism. 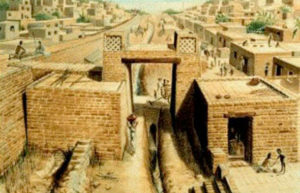 The information pertaining to the people of the Indus Valley Civilization is largely based on articles that were found in the cities. 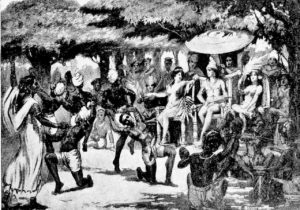 The people were essentially employed in agriculture, animal rearing, trade, metal industry, and construction. Cotton fabrics were popular and wool was used for warmer garments. Both men and women wore ornaments like necklaces, armlets, finger-rings, and bangles. Ornaments like nose rings, earrings and anklets were however worn only by women. The ornaments were made of gold, silver, ivory, copper and precious and semi-precious stones. Their household goods were vessels made of earthenware, metal and in some rare cases porcelain. Articles like spindles, axes, fishhooks, razors, and combs etc. have also been found. The children played with carved toys like small wheeled carts and chairs, and a dice indicating the possibility of board games. The people had domesticated animals like the humped bull, the buffalo, sheep, elephant, and camel. There are some doubts however on the existence of the horse. But the presence of the horse in the carved toys for the children indicates that they were familiar with the animal. Interestingly the weapons of war are essentially offensive in nature, like axes, spears, daggers. No defensive equipment like shields or armor has been found. The priests derived impressive control over city and town dwellers. This was because of their role as the intermediaries between the Harappan population and a number of gods and goddesses, whose provision of fertility was of paramount concern. Several of the gods are depicted on the not deciphered seals that are dominated by a naked male figure with a horned head and a fierce facial expression. On some of the seals, he is pictured in a crossed-legged posture of meditation similar to that which was later known as the lotus position. Numerous figurines of females, also naked except for a great deal of jewelry, have been found. These “mother goddesses” appear to have been objects of worship for the common people. On the other hand, the horned god was apparently favored by the priests and upper classes. The obsession with fertility was also reflected in the veneration of sacred animals, especially bulls, and by the large quantity of phallic-shaped objects that have been found at Harappan sites. The Indus Valley Civilisation was eventually destroyed by the aggressive barbarians as well as the nomadic tribes. These tribes came through the northern and north-western Passes of Bolan and Khyber, and through the Valleys of Hindu Kush. They came with their horses and crude weapons. The most important amongst them were the Aryans of Central Asia. The Aryans burnt their dead, worshipped (Agni) fire, and their supreme god Brahma, the creator. The Aryans despised the Native People of the Indus Valley Civilisation, for their short stature, stub noses, curly hairs, and dark skins. 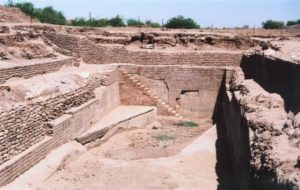 They were also jealous of the settled lives, well-protected settlements, and the highly productive agricultural practices they saw amongst the Indus Valley People. Without thinking, and in their attempts and eagerness to run over the native Indus Valley People, they senselessly destroyed and burnt the Indus Valley Settlements. As a result, the People of the Indus Valley Civilisation were disbursed, towards the south and easterly directions. Thus, the whole of the Indus Valley Civilisation was destroyed. And with that, went to wind, the Indus Valley Scripts, Science, Technology, Knowledge, Settlement, Production Techniques etc, that the Nation never recovered, and went down the drain as a nation of illiterates and backward. And, mind you, all learning building construction and production activities had come to stagnancy in the Country, till Ashoka. Even then, one today sees big ruins or grandeur remains. This was only restricted to the eastern and southern parts of the sub-continent. That explains the lack of literature and practically no remains of the cities and townships of the Aryans, their rulers, and even big kingdoms.